The Galaxy Note has been a success. When it first came out people laughed at how oversized it was, how you looked stupid holding it to you head, blah blah blah, jump forward six or seven months and it is a popular device in the modding community and also as a consumer device. I regularly see members of the public using the Galaxy Note. When Samsung released the Ice Cream Sandwich update for the Note it meant that it would still keep relevant for a while longer. Mine forms an essential part of my daily kit, mainly helping me add or edit content to this here very website. When the Galaxy S3 came out people started to wonder what the Galaxy Note 2 would be like. Rumours have suggesting that the Note 2 will have a slightly larger screen, a much better camera and a slightly overclocked version of the Exynos processor used in the Galaxy S3. Which all sounds great, if they can also squeeze in Jelly Bean, NFC, stereo speakers and a better stylus it will be amazing. 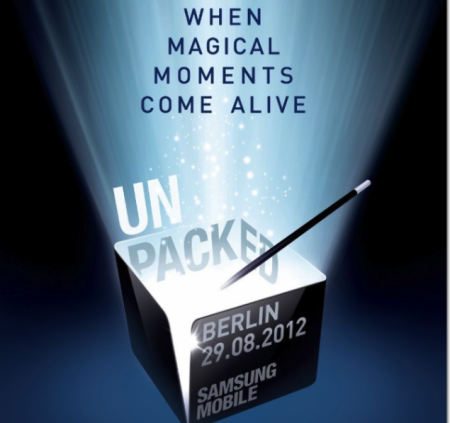 Either way on Wednesday the 29th of August Samsung will unveil the new Note in Berlin two days before the IFA Trade show. At this point in time I don’t think any of us will make it to Berlin, but we will certainly be covering it on the day. Samsung always seem to have a live feed somewhere so we should all be able to get a good look. What would you like to see in the Note 2? Let us know below.